It's Squirrel Appreciation Day and in a few hours I'll be at a party to celebrate our rodent friends. What, I can hear you cry throughout the interwebs, what in creation's name does one do to honor the bushy-tailed ones? Well there's a full list of activities over here. What has a hazelnut in every bite? 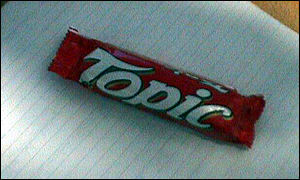 A Topic bar... and a squirrel turd. 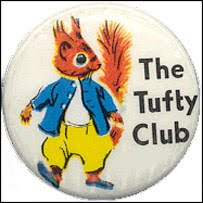 For genuine lovers of Tufty Fluffytail, the full Road Safety Public Information Film is available here and yes, I was in the Tufty Club and I proudly wore this badge. I always look both ways before I cross the road just as Tufty taught me. How are YOU marking this auspicious day? Had I not been bitten whilst feeding the evil varmints, I would totally support you. The Guy was bitten by a mouse this morning while attempting to save it from Hermes... Wildlife is never grateful is it? Thanks for letting me know about SAD. I shall mark my calendar for next year. Unfortunately we won't be celebrating today. Normally we keep the feeders full for our little friends (mostly for the Kitten's viewing pleasure) but it's been storming all week and all the feeders are filled with water. This week they'll have to make do with what Nature provides. Isn't every day Squirrel Appreciation Day? As in I would appreciate it if the squirrels didn't eat all the bulbs in the garden. . .
And here's to our little outdoor pals...just love when tourists take photos of them in Central Park like they're some kind of "real" wildlife.